Which is the Easiest way to Video Chat Between a PC and Android Phone ? With the availability of faster and affordable internet connections, people are now increasingly adopting video calling as their primary method of communication. Today, almost everyone on this planet has an android phone with a front facing camera on it and a data connection. With this it’s now possible to make video calls to anyone on the move. However, apart from the two requirements mentioned above, you will also need a app to make and receive calls from your android phone. Fortunately there are many apps on the Google play store that can help you with making and receiving video calls. But with so many apps, you are definitely going to have a hard time deciding between the best video calling apps for your phone. Well, for those who are looking for a simple and easy way to make and receive video calls between a PC and a cell phone, you won’t be needing anything apart from the Google hangouts app for your phone and a PC with internet access and a webcam. If you have them, you can easily initiate a video call from your Gmail account on a PC or even from the Hangouts app on your android phone. 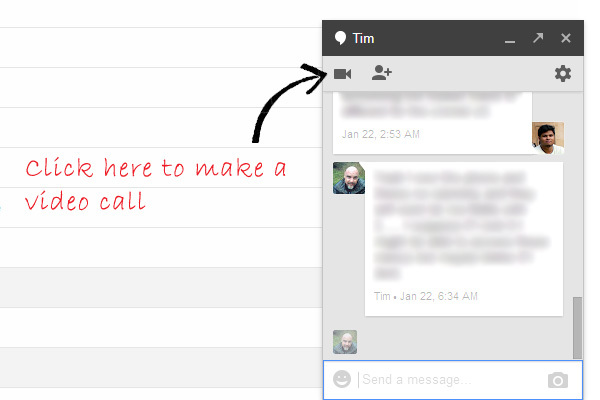 Most of you will be aware of this feature, but for those who are not here’s how you can initiate a video call from the hangouts interface in Gmail on a PC. Note: If you are using Hangouts for the first time to make a video call, you will have to install a small plugin by following the instructions provided onscreen when you click on the video call icon. Step 1: Log into your Gmail account and click on anyone who is online. Step 2: Next a chat tab will open to the right side of Gmail. Click on the webcam icon to initiate a video call. If the receiver is online on a PC and laptop with a camera or smartphone with Hangouts installed, you will be able to video chat with him. Now lets find out how you can initiate a video call from the Hangouts app on an android phone. Step 1: Install the Hangouts app on your android phone if you’ve not installed it. Step 2: Once installed, open the Hangouts app and tap on any contact who is online. Next tap on the video call icon to start a video call. You can either use hangouts to video chat between a PC and an android phone or even between two android phones. Additionally, on hangouts, video chat is not just limited to a single contact, you can also use it to make video conference with multiple contacts and the same feature is also available on the android app. Last but not the least, since Google can be virtually accessed from any device connected to the internet, Hangouts provides an simple and easy way to video chat between multiple devices and its the best part is it,s free of cost.